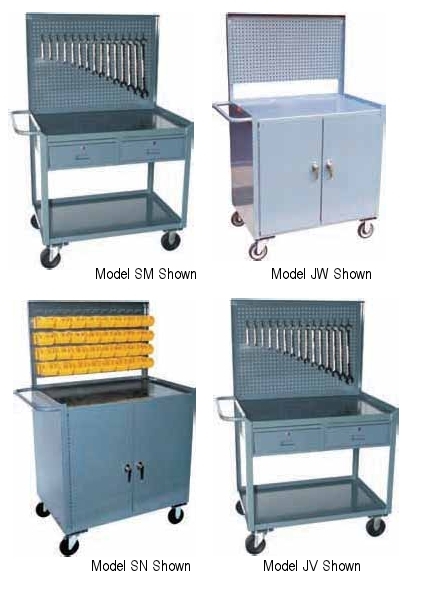 2 locking drawers (keyed alike) with 2 keys — 5"h x 16"w x 20"d (Models SM & SN). 14 gauge cabinet sides with lockable doors keyed alike with 2 keys (Models JW & JV). Top shelf has flush work area (front lip down other lips up). Bottom shelf lips up for retention (models SM & SN). Bottom shelf lips down (flush) models JW & JV. Overall height — 58" (62" with full pneumatic casters). Add middle shelf lips down — Code SM (Models JV & JW). Other bins available (see page 44). 14 gauge peg board (angle frame) — 19"h x 36"w.
Louvered panel (angle frame) - 19"h x 36"w that accepts different sizes of plastic bins. Includes 32 yellow plastic bins (4-1/8"w x 7-1/2"d x 3"h).